18 year old WALKING across Canada to raise funds for Cancer Research. Please donate and help find a cure. 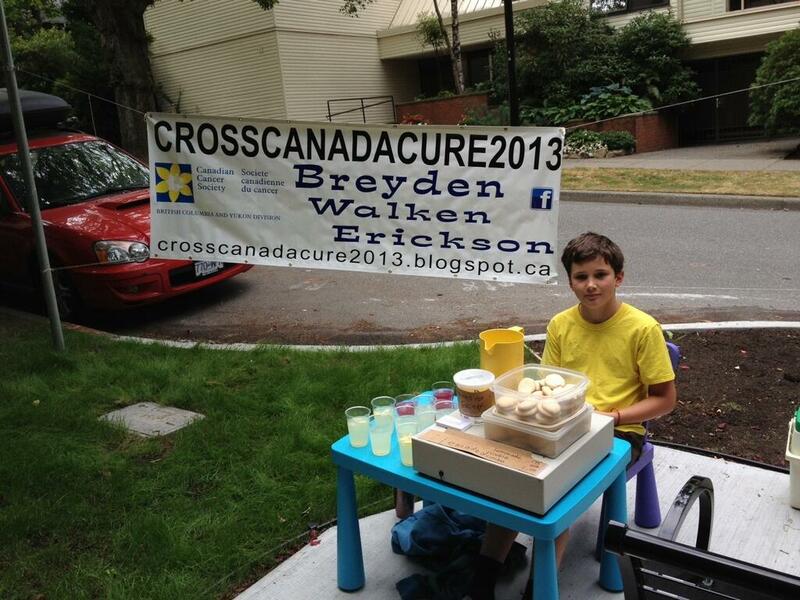 On Saturday Breyden's 10 year old cousin Alex had his annual Lemonade stand in Vancouver's west end. As he does every year, he makes the lemonade from fresh lemons. He also has fresh baked cookies and other goodies that he makes with his mom the day before. A real treat for Westenders on their way to the farmers market up the street. Thanks to everyone who stopped by the lemonade stand this morning! $60.20 was donated to the Canadian Cancer Society through the Cross Canada Cure. And then a very generous neighbor donated the remaining $39.80 to round it up to an even $100.